The Saluda County Historical Society invites all of you to come on Sunday afternoon, October 21, at 2:30 p.m. to the Saluda Theater and Museum where a tour of the two buildings will begin. Guides will be there to tell you the history of both buildings before and after the Saluda County Historical Society began their restoration. You will start in the museum, which houses three permanent exhibits—one that tells the story of the Alamo and the part Saluda natives James Butler Bonham and William Barret Travis played in what happened there. Another tells of the African-American experience in the county, and a third is a display of Indian artifacts from the Saluda River area. The current temporary exhibit “Treasures from the Attic” displays in interesting ways many artifacts used at various times in the past. After seeing the museum, you will go on to the theater, where you will learn its history from its 1936 opening through its glory days, its gradual decline , and its present use. Just before the pavement ends, you will see an old two-story house on your left and a driveway. Turn left into the driveway and into the gravel parking lot. Then come to the front door where guides will take you on a tour of the magnificant old house built before the Revolutionary War. They will tell you of its history and of Alamo hero James Butler Bonham, who was born in the house. People from all over the United States have visited the house and been amazed at its condition and its history. You will have time to look and to ask questions if you choose. When you have finished the tours, you can enjoy refreshments and conversation in one of the large rooms at the old house. 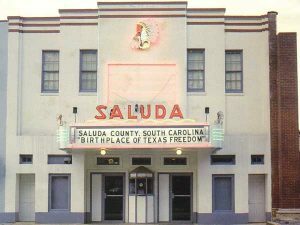 The Saluda Historical Society is hosting this tour as a window on one part of the work that the people of Saluda County and others have helped the Society accomplish during the twenty-five years since its creation.